In Earth orbit, a mysterious spacecraft silently opens a hatch to reveal an armored crew. Their goal is to steal a top secret US defense surveillance satellite. The crew disregard the automated warning given by the satellite and proceed with their mysterious mission. Back on Earth, Nova is flying his friends, Bernie Dillon and Roger "Caps" Cooper, to a cabin owned by Bernie's cousin. The Human Rocket tells them he has to answer a distress call received by his helmet's radio. Switching his uniform to its space mode, Nova traces the signal into Earth orbit and the mysterious spacecraft. Nova engages in battle with the armored spacemen and quickly defeats them. He orders the crew to land their spacecraft and inform the Air Force of their arrival. When the Air Force jets arrive, Nova flies off believing they have the matter taken care of. He listens in on the radio conversation through his helmet and hears the spacecraft explode! Stunned, Nova returns to his friends at the cabin. He's not in a good mood and goes inside. Meanwhile, in an underground bunker in the Appalachian Mountains, a group of powerful beings are being briefed on the satellite incident. Those responsible for the destruction of the spacecraft inform them of their mission. They are to destroy Nova! Back at the cabin, Nova has switched back to his normal identity of Rich Rider. He tells his friends what happened in space and they attempt to cheer him up. They prove to be unsuccessful as Rich wonders how his love interests, Laura Dunham and Namorita, are. We find that both women are also wondering what their feelings are for Rich. Soon afterwards, the cabin is suddenly attacked by the group of beings from the underground bunker! They announce themselves as Shatterforce and destroy the cabin! Rich quickly changes to Nova and begins battling Shatterforce. 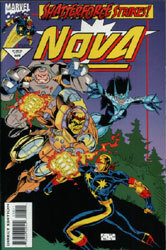 During the fight, Nova learns one of the members, Warhead, has a grudge against him. Warhead refuses to tell Nova why he hates him but insists he will destroy him. Nova feigns weakness in order to draw his foes closer to him. At the right moment, he unleashes a fierce attack on Shatterforce! However, as he is about to finish the battle, Nova is distracted by his friends. Bernie and Roger have tried to find shelter aboard Shatterforce's ship and have activated an alarm. The distraction is enough for Murder and Warhead to blast Nova unconscious! As Strangler marches off to kill Rich's friends, Murder and Warhead prepare to destroy Nova!